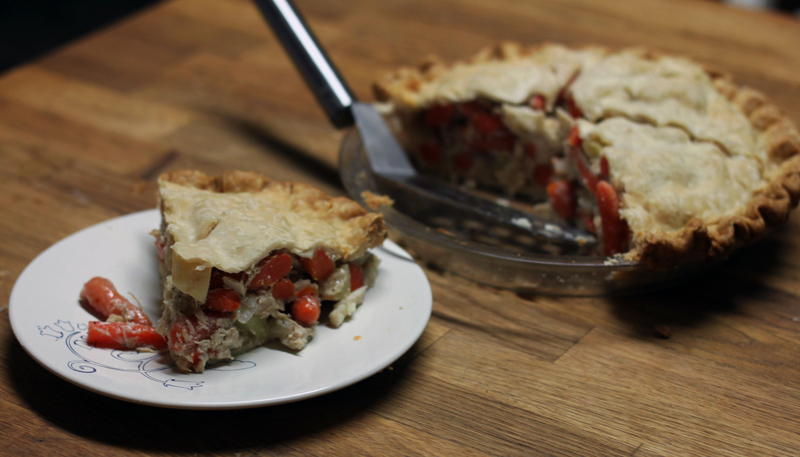 The original recipe for this delicious pie comes from the Farm Journal’s Country Cookbook. I’ve adapted it to suit my family’s tastes and it is a favorite in the fall and winter months. Our family likes veggies, so I’ve added vegetables and adjusted the broth so that it has a savory flavor that can’t be beat. It can be frozen, so you can eat one the day you make it and freeze the other for another cold winter night. There’s nothing quite like coming home from school–that includes me since I’m a teacher–and smelling a chicken pie baking in the oven. The scent meanders through every room making every stomach in the house rumble in anticipation. Serve with a green salad or just all by itself. You’re going to love it! In a six quart pot put 2 lbs chicken breast, 1 lb baby carrots, 1 medium onion chopped, 1 tsp garlic powder, 1 Tbs. salt, ¼ tsp pepper, and 6 cups water. Boil until chicken is tender about 40 minutes. Alternately, you can put it all into a crock pot and cook on low for 8 hours or on high for 4 hours. 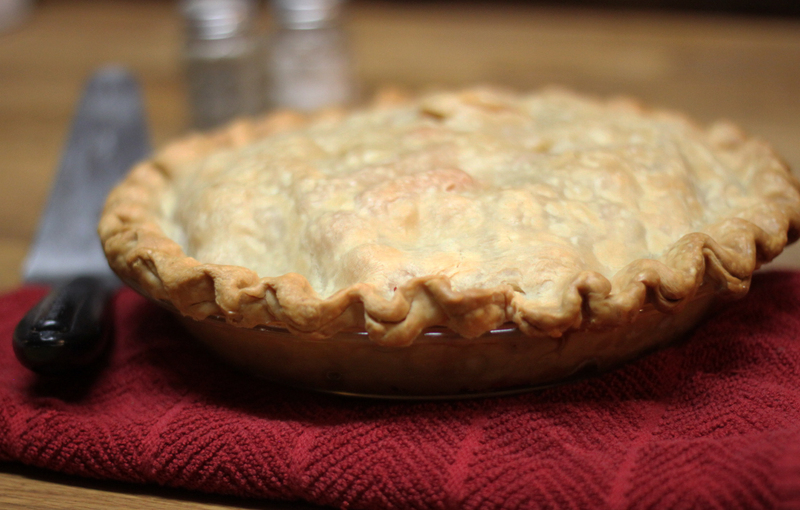 While you are waiting, put crusts into pie pans to get ready for filling. Measure 3 cups of the broth into a large skillet and bring to a simmer. If your broth has decreased so that you have less than 3 cups (you should be pretty close) add water to compensate. Cut up 3 medium sized potatoes into 1 inch chunks and throw into the broth as it simmers. In another cup measure 1/2 cup of broth (or water) with 2 Tbs. flour, ½ tsp salt and a sprinkle of pepper. Mix this thoroughly with a fork and pour into simmering broth. After the broth has thickened some cut up chicken and add to broth along with carrots, onion and a large bag of mixed veggies. Heat through and watch until thickened like gravy. At this point you may want to test the saltiness/pepperiness of the mix to see if you need to adjust by adding salt or pepper. 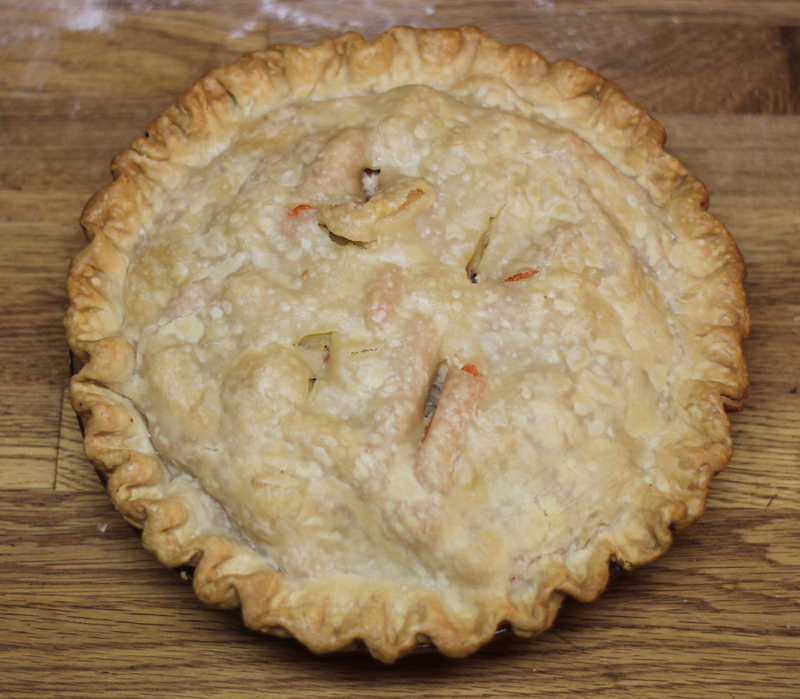 Scoop pie filling into each crust and cover with top crust. Flute crust and create vents for baking. Bake at 375 degrees for 40 minutes or until golden brown. Let set for 10-15 minutes before serving.